I first went to Au Bon Pain when I visited my sister in Pittsburgh. I got off the flight & was hungry, so she took me to the Au Bon Pain in the airport. I went wondering what I'd get there to eat. And hoping it would be healthy and not the usual American fare! I had my taste of broccoli & cheese that day. Now, here I must mention that I am not a fan of broccoli (read I never ever ever ate it before & thought of it as spoilt cauliflower!!!). However sis insisted it was great & since I was tired, I gave in, thinking the cheese would camouflage the broccoli. Was I surprised - the soup was delicious!! So, much that I insisted on taking some back for dinner! :) Since then I've always loved Au Bon Pain. When I learnt that they were opening in Bangalore I was thrilled. 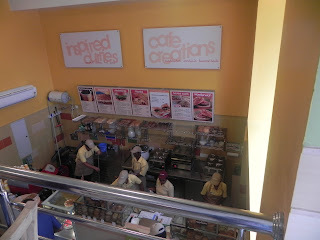 I've been to their outlets in Mantri Mall, Eva Mall, Richards Park & Cunningham Rd. 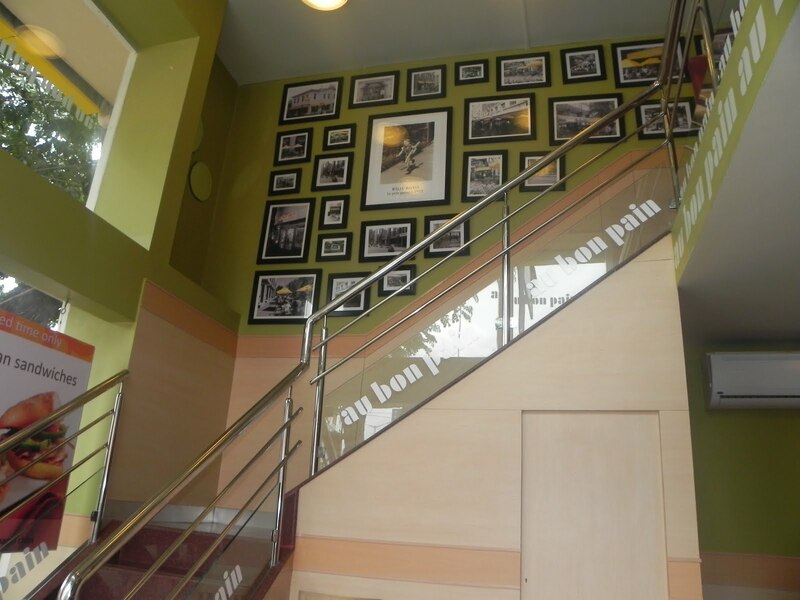 Au Bon Pain has recently opened a cafe in Koramangala at the Sony signal. Parking there is going to be difficult, but for folks with offices around there, you just got a place to go to for healthy meals! Can you believe in this day & age, they actually do not serve any fried food in their restaurant. Yeah, you read right, no fried food at all!! Interesting isn't it? We tried the chicken pesto sandwich on the farmer's bread & a hummus & olives sandwich on a jalapeno bagel- both were good. P being a biryani fan tried the chicken biryani and wasn't very impressed. 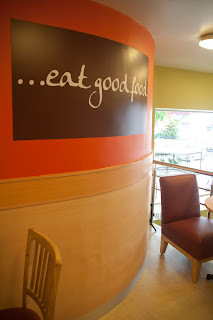 Considering this is a bakery cafe, biryani might not be the best item to choose from the menu. 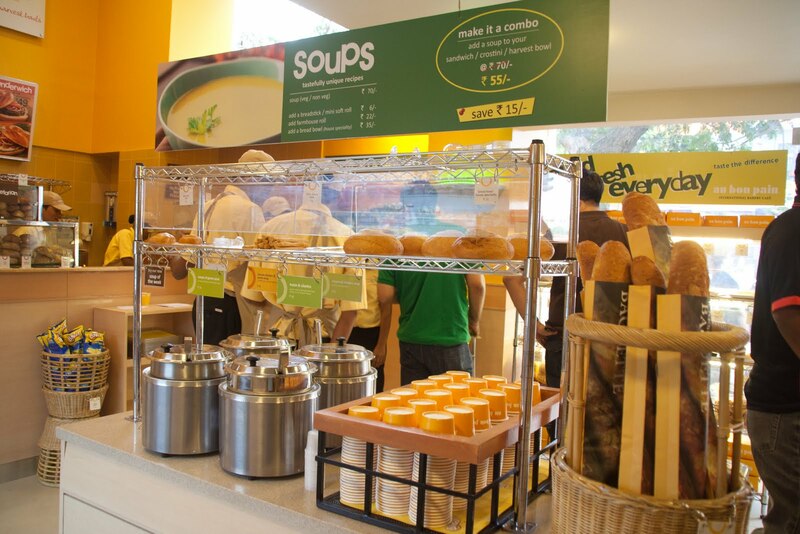 Au Bon Pain has a variety of salads, baked goods & assorted desserts. I loved the cinnamon roll from the bakery and the espresso mousse (- simply divine) from the dessert section. Oh, how can I forget the coffee! Really good stuff! And at Rs.20/- very good VFM too! They also had a cold coffee and some iced teas. And all of them reasonably priced too. Well, all items are reasonably priced and made fresh. This is one place I'll be going back to often. So, what are you waiting for? Go ahead, eat well & eat healthy!